Speaking of Women's Rights: Strike Up the Band for the Unsung (and the known) Heroines! Strike Up the Band for the Unsung (and the known) Heroines! One of the great things about Women’s History Month and International Women’s Day is the discovery of women’s accomplishments you’ve never heard of. Equally heart-warming are the ceremonies and awards that surface every year acknowledging women who have been overlooked. How could we fail to be touched by the bestowing of the Congressional Gold Medal on 200 surviving members of the Women’s Airforce Service Pilots (WASPs) on March 9th? During World War II more than 1,000 women pilots flew throughout the U.S., ferrying planes to where they were needed, hauling targets for shooting practice, and performing duties that freed male pilots to serve in the theaters of war. They were denied veteran status until 1977, and basically discarded once the war was over. They even had to pay their own bus fare home. Yet their patriotism was magnificent, and remains undimmed: when the Star-Spangled Banner was played at the medal ceremony, one of the women rose from her wheelchair and saluted throughout the song. Of course, these aren’t the only woman whose vital contributions have been overlooked. Our history abounds with them, once you start to look. Fair warning, though: it can be tough to find them, as they are unsung. In other words, the usual Catch-22 when it comes to exploring women’s history. But I’ve managed to find a few whose stories inspire me and illuminate our society. 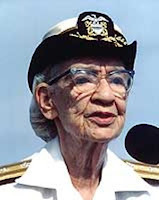 Many of you have heard of Grace Hopper, who was not only a distinguished Navy Admiral, but also a pioneering computer programmer and the co-inventor of COBOL. But did you know about Ada Byron Lovelace (daughter of Lord Byron of poetic fame), who developed a method of using punch cards to calculate numbers, becoming in essence the first computer programmer? 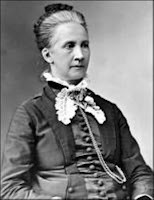 Or what about Catherine Littlefield Greene, wife of Revolutionary War General Nathaniel Greene (himself a sometimes-overlooked hero), whom many people say was the true inventor of the cotton gin? At a minimum, Eli Whitney could not have completed the invention without her. For every Marie Curie, there’s an Ada Lovelace, a Belva Lockwood, a Bessie Coleman . . . I could go on, but it's fun to explore, so why don’t you?